The EEZWALKER Handler Bag with Bungee Leash is a bag and leash combination that attaches around the handlers waist. This is convenient for working, walking, and jogging your dog allowing your hands to be free from holding the leash. I use hands free leashes because the dog learns to walk or run with my gate. The stretch in the bungee leash is a great feature because the give of the leash causes the leash to have smooth movement between the dog and handler. If you are jogging and stop quickly there isn’t a jerk in the leash but time for the dog to have an extra step to stop. Having your hands free makes jogging, pushing a stroller, pushing a grocery cart, opening doors, and loading the dog in and out of vehicles very useful and accessible. 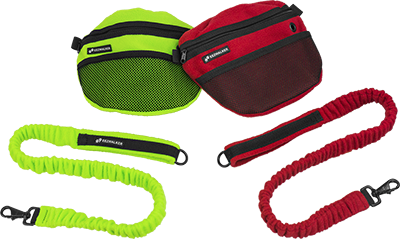 The handler bag outer layer is made from fleece and comes in all the EEZWALKER color choices. The bag opens and closes securely with a zipper closing. The bag interior is lined in water resistant lining and that makes for easy clean out with a damp towel. On the front of the bag there is a grommet opening so you can have your poo clean up bags ready to grab without having to unzip the bag. The bag is contoured to fit around the handler’s waist and is deep enough to hold training treats and other items, such as wallet, keys, sunglasses, poop bags, etc. There is a front lower net pocket for quick access items such as a phone, ID, or pepper spray that many joggers often carry. The handler bag attaches to the waist with the use of an adjustable belt. The belt is made from heavy poly nylon and is adjustable. The belt will fit waist measurements from 28-52”. The handler bag can be removed from the belt and the belt used alone with the leash. Stitched into the belt is a black metal spring bolt snap for attaching the bungee leash. The bungee leash is covered with fleece and features a soft looped handle. The bungee leash can be used separately or attached to the belt snap. The leash length unstretched is 36”. Lined bag for easy clean-up. Quick access lower front pocket. Adjustable waist belt has a side release buckle. Flat bungee leash w/looped handle, can be used separately.